Recent release “Brain Beat: Scientific Foundations and Evolutionary Perspectives of Brain Health,” from Page Publishing author Michael Hoffmann MD, PhD, is a scientific and philosophical work aiming to educate the reader on the brain’s functions. Michael Hoffmann MD, PhD, a graduate with a Medical degree (MBBch) from the University of Witwatersrand, Johannesburg, South Africa; Senior Medical Doctorate (MD) and PhD in behavioral medicine, Professor of Neurology with the University of Central Florida and University of Florida (courtesy), director of Stroke and Cognitive Neurology divisions at the Orlando VA Medical Center, cognitive neurology consultant at the Roskamp Neuroscience Institute in Sarasota, Florida, educator, researcher, writer and author, has completed his newest educational work “Brain Beat: Scientific Foundations and Evolutionary Perspectives of Brain Health”: a telling and informative work that explains the connection between environment and the brain. “BRAIN BEAT is a scholarly and exceptionally lucid presentation of Neuroarcheology and brain health. It is also a good read. What I find most useful is the gradual and fascinating exposition of how present-day individuals have evolved from earliest origins to the point where we are changing ourselves through what is now called cultural Neuroarcheology. The explanations of biological, neurological, and psychological specifics provide the beginner with a solid scientific background, and the professional with a new way to think. Lucid, scholarly, and a fascinating read, BRAIN BEAT will provide you with both the basics and advanced aspects of Neuroarcheology and how it relates to brain health. This integrative new field brings the sciences and social sciences into a new theoretical and practical integration. Dr. Hoffman makes Neuroarcheology understandable to the lay public, while simultaneously challenging us professionals to ‘think different’. If you are serious about life, don’t miss this important book. In short, this book is outstanding,” said Allen E. Ivey, Ed.D., ABPP, Distinguished University Professor (Emeritus) University of Massachusetts, Amherst. 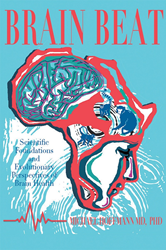 Readers who wish to experience this profound work can purchase“Brain Beat: Scientific Foundations and Evolutionary Perspectives of Brain Health” at bookstores everywhere, or online at the Apple iTunes store, Amazon, Google Play or Barnes and Noble.